Superzoom lenses make a lot of sense. Your average digital SLR kit lens offers a focal range of 18-55mm, and you might extend that with 70-300mm telephoto zoom – but a lens like the Sigma 18-300mm f/3.5-5.6 can do the job of both. Early superzooms had a focal range of 18-200mm, but since then independent lens makers Tamron and Sigma have been slugging it out with ever-longer zoom ranges. Even Nikon joined in, briefly holding the crown for the longest zoom range of all with its 18-300mm lens. Of course, that only fits Nikon cameras. But Sigma's new 18-300mm matches it for focal range and comes in Sigma, Nikon and Canon mounts, with Sony and Pentax versions to follow. 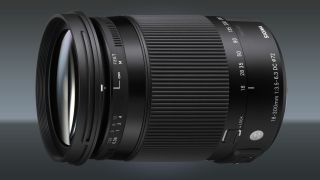 The full name is the Sigma 18-300mm f/3.5-6.3 DC Macro OS HSM. The 'OS' stands for Sigma's own optical stabilization system, said to be improved in this lens. It won't feature in the Pentax and Sony versions because these camera bodies have their own sensor-shift anti-shake systems. The macro feature is especially interesting. This lens will focus down to a reproduction ratio of 1:3, which is still some way short of true 1:1 macro reproduction, but will still yield impressive close-ups. But there will also be a separate close-up lens which will reduce the ratio to 1:2. This will make the Sigma 18-300mm very versatile indeed. But there is a fly in the ointment for Sigma. Its new lens has already been trumped by the Tamron 16-300mm superzoom. It has the same maximum focal length as the Sigma, but goes just that little bit wider at the other end of the scale – 16mm versus 18mm. The Sigma could still win on price, though. It goes on sale in September 2014 for £499, which is very competitive for a lens with this kind of range.